Our First Aid Training and CPR training will prepare you to calmly and confidently handle emergency first aid scenarios. 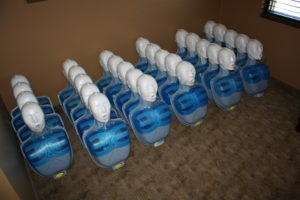 Basic techniques for First Aid and CPR are delivered by Trinity’s experienced instructors in an environment that is fun, informative, and interactive. You’ll learn about important lifestyle choices that help prevent illness and injury, and how to deal with unexpected accidents that may occur. 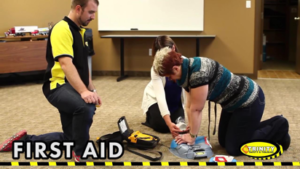 Trinity Safety & Training uses the Canadian Red Cross or the St. John Ambulance curriculum. Our ‘in-house’ class follows the St. John Ambulance curriculum. However, for private classes the choice is yours. If you are unable to make it to our new training facility, call us today and book your next field training session. All students who complete the course successfully will receive a personal wallet size Red Cross First Aid / CPR Certificate. This course is available in Saskatoon. All students are required to present a current Standard First Aid certificate. 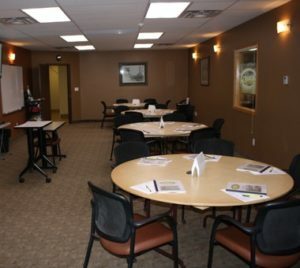 The classroom is spacious, bright and climate controlled, with plenty of room for the practical portions of H2S Alive and Fall Protection. Large whiteboards and big screen TV’s enhance the learning experience as well as displays of antique equipment and future prototypes.